Well, the best laid plans and all that. 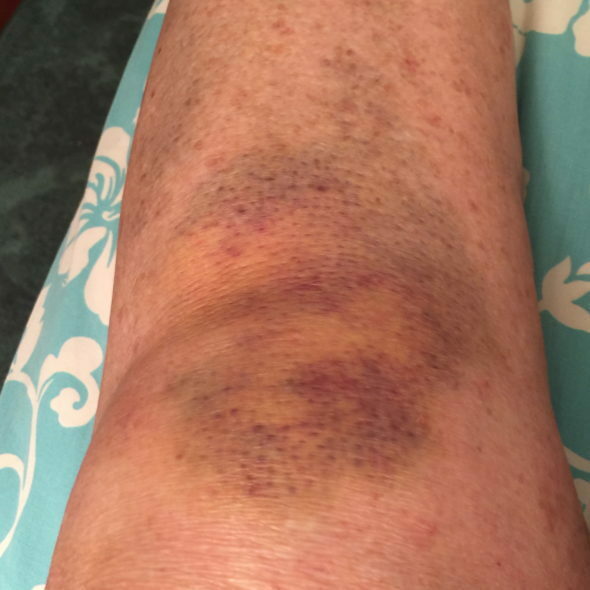 About 3 weeks ago, I stumbled while heading out my bedroom door, tripping over the wheel of a chaise lounge and landing hard on my left knee and side. This doozy of a bruise complicated my life two weeks later when it was discovered that I had — once again — multiple small blood clots in both of my lungs. This was so not on my calendar, friends. SO NOT. We spent one entire Saturday in two different emergency clinics to receive this explanation for the searing back pain that had kept me wakeful most of the previous night. Some of you may remember that another series of falls two years ago took me off of the blood thinning medicine I was taking at the time – coumadin. Now I’m on a newer version called Xarelto, twice a day for three weeks to help break up these clots (and hopefully, the small, tender hemotoma or two that still remain from this yucky bruise) and then once a day thereafter, probably for however much longer I live. I will actually be visiting my blood specialist at about the time this will arrive in your inboxes today — hopefully, I’ll learn more then. Our bodies are marvelous things, able to accomplish so many different things, holding us upright for decades, birthing babies, handling late hours and too many burdens. And then, one day, they’re proven to be fragile, difficult, complex and limiting. Yes, there are limits. And I’m re-learning mine these days. Not thrilled about this kind of revision, but hopefully, open to learning what it may teach me. Thanks for your kind words and for your prayers, Patricia. I’ve done a shabby job of keeping up with the entire world’s 31-Days Offerings, but happened upon this one, and am so glad to know your situation so that I can pray for you in the coming days. Thank you for persevering in your view of this as a “revision” — I’ll be praying that His purposes will be revealed in spite of the frustration you must be feeling right now. Thanks, Michele. All prayers welcomed and appreciated. So sorry this happened, Diana! I will be praying for your quick healing and recovery, my friend. And yes, that difficult thing about aging is how this body of ours decides it’s not as young as we feel. May God fill you with His peace and love. Exactly! Feel lots younger on the inside of this body then the workings of it are telling me I am!